Mumbai has never needed an excuse to unfurl the bunting for its favourite son. But in the last few days India’s greatest city has moved into overdrive. 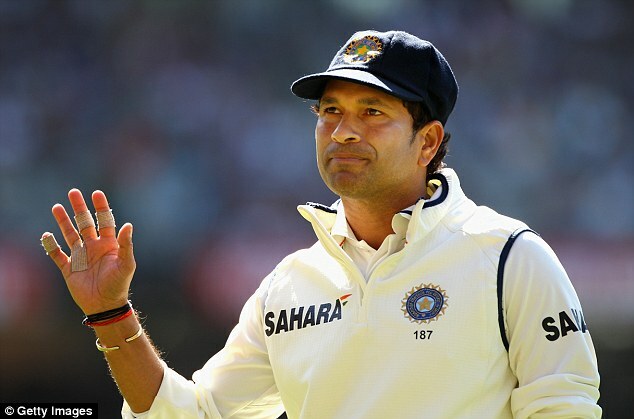 Sachin Tendulkar is about to play his 200th Test. And, as befits a cricketer who likes to deal in nice round numbers, it will also be his last. The mood is poised somewhere between a funeral and a celebration. 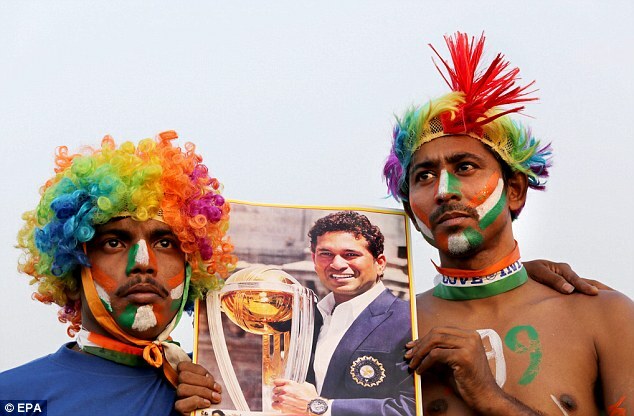 Most observers are content simply to shower praise on one of the most enduring phenomena in all sport, possibly because they know that the alternative — life without Tendulkar — is just too bleak to contemplate. 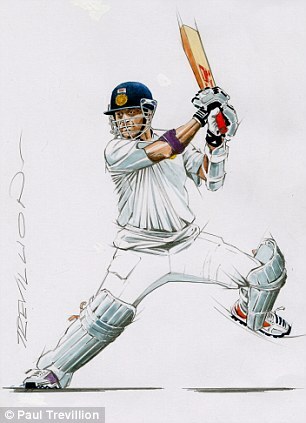 The Daily Mail is not using live pictures from India’s Test matches because of a dispute with the Board of Control for Cricket in India. 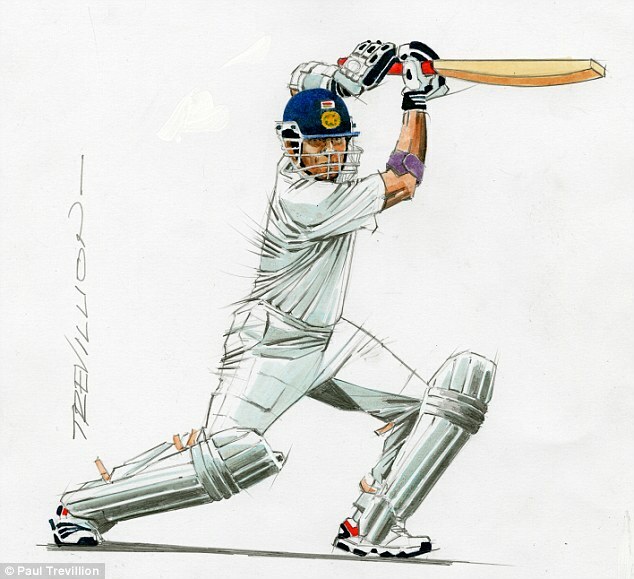 We have commissioned a series of drawings by legendary master of movement Paul Trevillion to mark Sachin Tendulkar’s final Test. 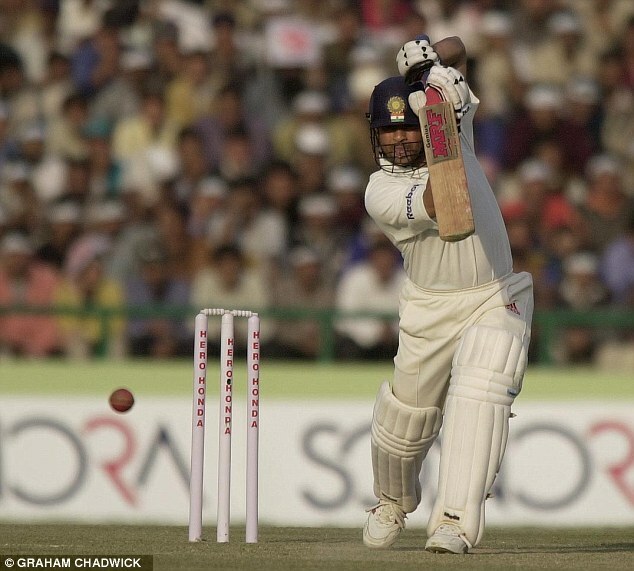 When the second Test between India and West Indies begins at Mumbai’s Wankhede stadium at 4am UK time tomorrow, Tendulkar will embark on the last leg of a journey that began at the age of 16 in a Test match at Karachi. That was in 1989, six days after the fall of the Berlin Wall. 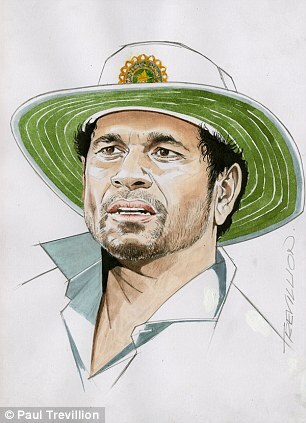 As if in sympathy, Tendulkar has spent much of the 24 years since constructing his own impenetrable edifice, leaving bowlers to bang their heads against something akin to bricks and mortar. 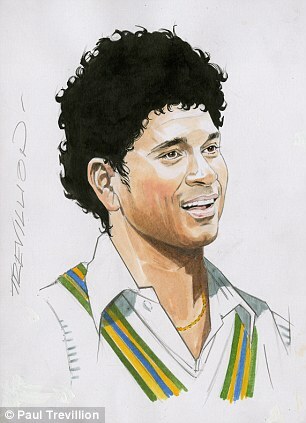 Sportsmail are offering one reader the chance to win the brilliant original artwork of Sachin Tendulkar by master illustrator Paul Trevillion, while 10 runners up will receive prints. CLICK HERE for more information and to enter the competition. Most international cricketers would be thrilled with even 10 years at the highest level; Tendulkar’s career has spanned four decades. And in that time he has moulded the psyche of the second-most populous nation on earth. Even by Indian standards, the excitement here is palpable. Giant advertising billboards taken out by Star Sports, who are broadcasting a series that was shoehorned into the schedule as part of the careful stage-management of Tendulkar’s retirement, are proclaiming a simple tagline: ‘Believe’. No one seems especially minded to ask what it is we are supposed to believe, although the most plausible explanation lies in the nickname given to him by younger members of the Indian team: ‘Bhagwan’ is the Hindi word for God — and right now Mumbai feels like a city of 20 million believers. 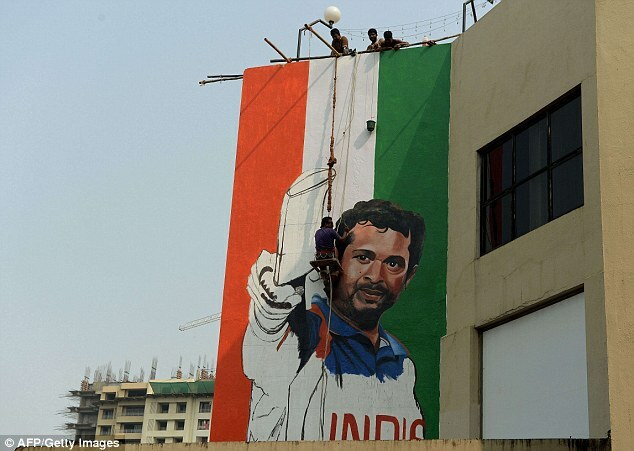 Tendulkar’s home town is not alone. When the first Test took place at Kolkata’s Eden Gardens last week, Bengali spectators held up signs proclaiming ‘Godbye’, happy in the knowledge that this was one spelling error that would not need correcting. Even Tendulkar’s mother, Rajni, will break the habit of a lifetime this week and turn up to watch her son play; a special wheelchair ramp will facilitate her entry into the stadium, where security staff will presumably be on red alert to spare her an ear-bashing from quote- hungry journalists. The hope is that things go rather better in Mumbai than they did in Kolkata, where India hammered West Indies by an innings, and Tendulkar’s sole knock produced only 10 runs. To make matters worse, he fell victim to an iffy lbw decision from English umpire Nigel Llong, who was duly made a convenient scapegoat in next day’s press. 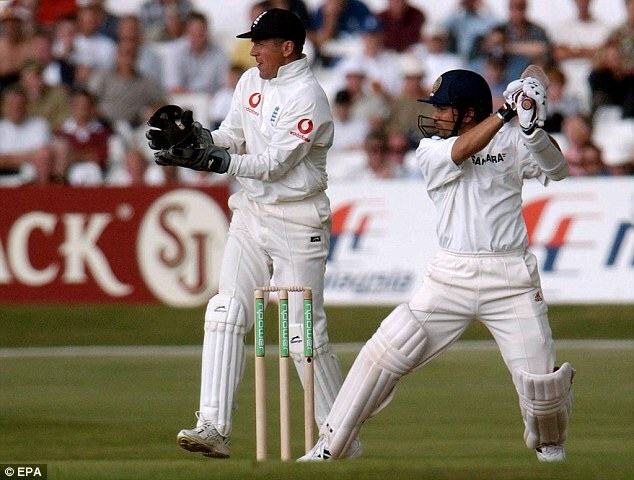 One local paper described the dismissal as a ‘tragedy’ – proof that, even after all these years, Tendulkar and hyperbole sleep in the same bed. The Cricket Association of Bengal, meanwhile, had planned to shower Eden Gardens with 199kg of rose petals, but that was scuppered when India won on the third day: under-fire officials insisted the intention had been to book the planes for the fourth and the fifth. Mumbai has not escaped censure, either. Only 3,500 tickets (the Wankhede holds 32,000) have been made available to the public and the website selling them crashed immediately. The great and the good of contemporary cricket have got in line to deliver their verdicts. West Indian great Brian Lara compared Tendulkar to Muhammad Ali, while Rahul Dravid — a long-time former team-mate — said he would choose Tendulkar ‘to bat for my life’. One of few dissenting voices has come from former Indian captain Sourav Ganguly, who had the temerity to allude to Tendulkar’s mediocre record over the past couple of years. 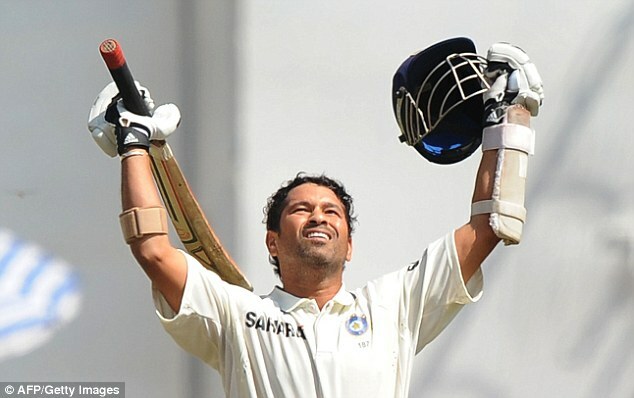 Even accounting for the fact that Tendulkar’s most recent Test hundred came in January 2011 at Cape Town, his statistics remain wondrous. The next-most capped Test cricketers are the former Australian captains Steve Waugh and Ricky Ponting, who both made 168 appearances; Dravid and South Africa’s Jacques Kallis are on 164. And Tendulkar might have been even further ahead had India not turned its attention so determinedly to one-day cricket and Twenty20. Then there are the runs. 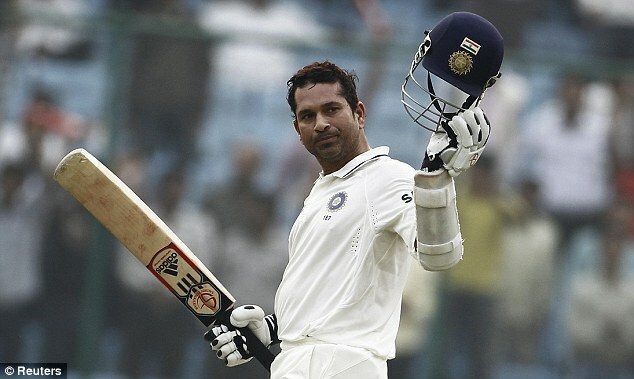 Of the 55 players – the majority of them batsmen – to have appeared in at least 100 Tests, only two have a higher batting average than Tendulkar’s 53.71: Sri Lanka’s Kumar Sangakkara (56.98) and Kallis (55.44). And neither Sangakkara nor Kallis had to placate a billion fans. 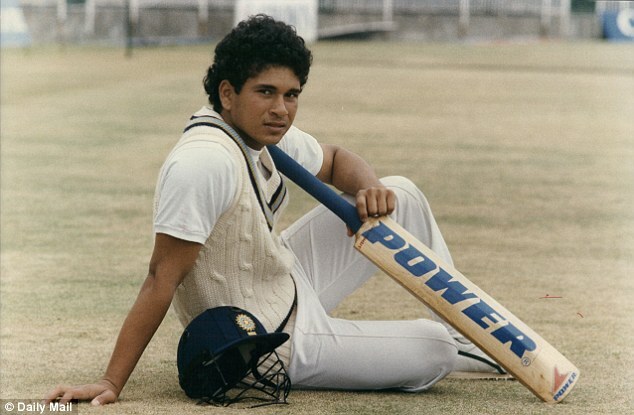 It seems strange to think that, in a country where 60 per cent of the population is under 30, memories of Tendulkar’s debut now have to be passed down from one generation to the next. 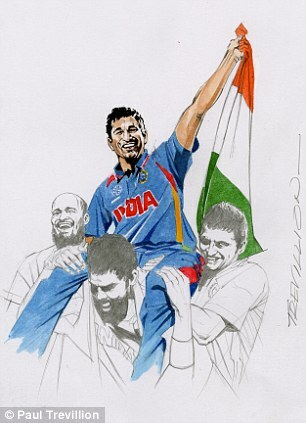 The whole of India is hoping – no, praying – that his finale will be spoken of with the same reverence.